We all know the bench press is a great exercise, but the close-grip is a great variation. Find out how this can help you grow different muscles and achieve a great all-round physique. Right now in gyms all across the world, men are doing bench presses in order to get stronger and develop the muscles in their chest. They are loading the barbell with as much weight as they can press in order to achieve their muscle building goals. The traditional bench press is a good way to build up the pectorals, but there is another variation that will benefit you as well. This variation is the close grip bench press. This article will explain how to do the close grip bench press and give you reasons for doing this exercise. The close-grip bench press is a valuable alternative you should try. As opposed to the traditional bench press, the close grip bench press primarily targets your triceps. The secondary muscles used in this exercise are the chest and shoulder muscles. To begin this exercise, you should lay on a bench with your feet planted firmly on the ground. The barbell should already be loaded with the amount of weight that you intend to lift. Grip the barbell with your palms facing away from you. Your hands should be 8 to 12 inches apart. With your back slightly arched, take the weight off the rack. Keep your elbows tucked into your sides and lower the weight until it is about an inch from your chest. At this point, contract your triceps and push the weight upward, but don’t lock out your elbows. This completes one rep and you can continue on with the exercise for the desired number of repetitions. This exercise is perfect for building up your triceps, but that will only happen if you perform it correctly. Your elbows must be kept close to your body throughout the exercise in order to force your triceps to do the work. You should also focus on contracting and stretching your triceps while performing this exercise. When you are lowering the weight you should picture your triceps contracting and when you raise the weight you should focus on the stretch. Lastly, the timing of this exercise is very important. You should be lowering this weight with a count of 4 and raising the weight with a count of 2. 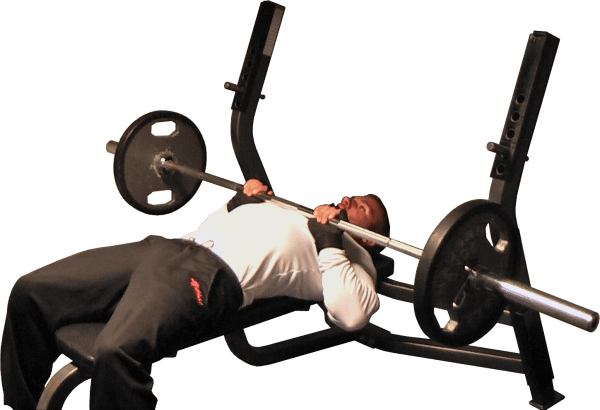 The bench press primarily targets the tricep muscles and it is very effective at increasing the size of your triceps. When training triceps lots of bodybuilders tend to focus on isolation exercises. While this will help increase the size of your triceps to some degree, the close grip bench press targets all three heads of the muscle while still working your front deltoids and chest muscles as well. Multi-joint exercises always lead to more growth than isolation exercises. With the traditional bench press, the major muscles worked are the pectorals and the triceps and shoulders are worked peripherally. By placing more emphasis on building up and strengthening your triceps, you will increase the amount of weight you can lift when doing the traditional bench press. The close grip bench press allows you to handle more weight than other triceps exercises. In turn, this will give you the opportunity to get as strong as you can. Unlike isolation exercises, your triceps get assistance from your shoulder and chest muscles and this lets you lift heavier weight. If you perform close grip bench presses in a rep range of 1 to 5 (lifting as heavy as you can), you will notice a distinct increase in strength over a period of time.